Pocket Brix-Acidity Meter | ATAGO CO.,LTD. What's important is the balance of sweetness and tartness ! This Master Kit is specifically for measuring apple and includes everything you need for easy, precise and accurate measurements. This Master Kit is specifically for measuring kiwi and includes everything you need for easy, precise and accurate measurements. This Master Kit is specifically for measuring Plum and includes everything you need for easy, precise and accurate measurements. This Master Kit is specifically for measuring Pear and includes everything you need for easy, precise and accurate measurements. This Master Kit is specifically for measuring Mango and includes everything you need for easy, precise and accurate measurements. This Master Kit is specifically for measuring beer and includes everything you need for easy, precise and accurate measurements. This Master Kit is specifically for measuring sake and includes everything you need for easy, precise and accurate measurements. 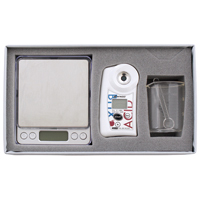 This Master Kit is specifically for measuring milk and includes everything you need for easy, precise and accurate measurements.